Concrete is today a popular material in all aspects of home design. While the concrete foundation of a home was once always covered with traditional flooring material, such is not the case today. Polished concrete floors are stylish and sophisticated and referred to as the most widely considered flooring option for a home with a modern design. 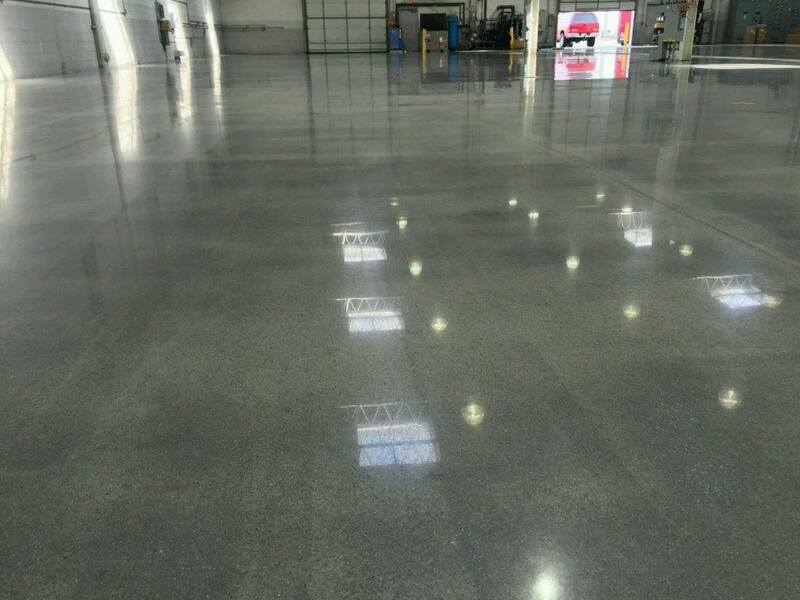 Polished concrete is a concrete floor chemically treated with a densifier (works to fill in pores and holes). It is then ground down with fine grinding tools. As the number of grit increases so does the fineness of polished concrete. Polished concrete has an amazing range of options to achieve your desired color, design and texture. Polished concrete can be painted or stained. You can also achieve textured patterns that can mimic the look of stone, marble and many more including wooden flooring. Polished concrete combines form and function and represents extreme value for money. There are unlimited color options for polished concrete. Colors are achieved through dyes and stains. Dying and staining polished concrete achieves any color you desire. Concrete is no longer limited to the gray color. There are a wide variety of sheens and shades to choose from to achieved your desired color. Colored aggregate can either be combined with the concrete mix or applied on the top layer of the concrete mix. Polishing will reveal the color of the aggregate. Some homeowners prefer plain gray polished concrete. Gray polished concrete is simple and provides your home with a bit of an industrial look. 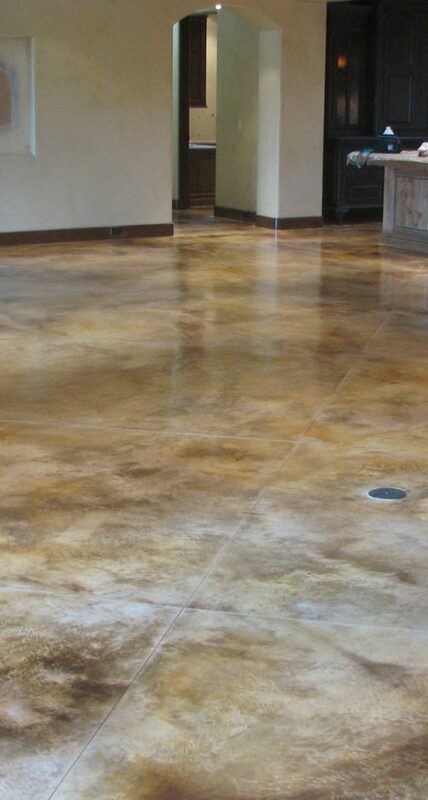 Concrete stains add color to an existing concrete floor. Concrete dyes are more vibrant in color than chemical stains. It is easy and quick to add dyes to polished concrete. Polished concrete designs make your concrete floor one-of-a-kind. Polished concrete can be treated with a wide choice of dazzling effects to achieve stunning floors. Stenciling, cutting, scoring and engraving are processes to customize the design of polished concrete aside from coloring. A combination of multiple colors and modern application techniques create intricate and amazing designs on polished concrete. Glass can be combined with the concrete mix and during the polishing process the glass pieces will show. Computer chips, bolts and nails can also be combined with the concrete mix. They appear smooth after the polishing process. Any of these techniques can be combined in a pattern. Imperfect or uneven concrete floors are installed with polished overlays for an aesthetically pleasing look. Intricate designs and logos can be stenciled on polished concrete. Stenciled designs become a permanent part of concrete. The logo or design embraces the shine and luster of polished concrete to make it look as though they are on the concrete surface or below it. There are numerous tools and materials that can be used to add texture to polished concrete floors. Polished concrete are no longer referred to as an unrefined and industrial looking flooring option. This flooring option is today regarded as being trendy with numerous benefits and applications. It is also now widely used in the residential setting. In the residential setting colored and decorative polished concrete are a blend of elegance charm and beauty. 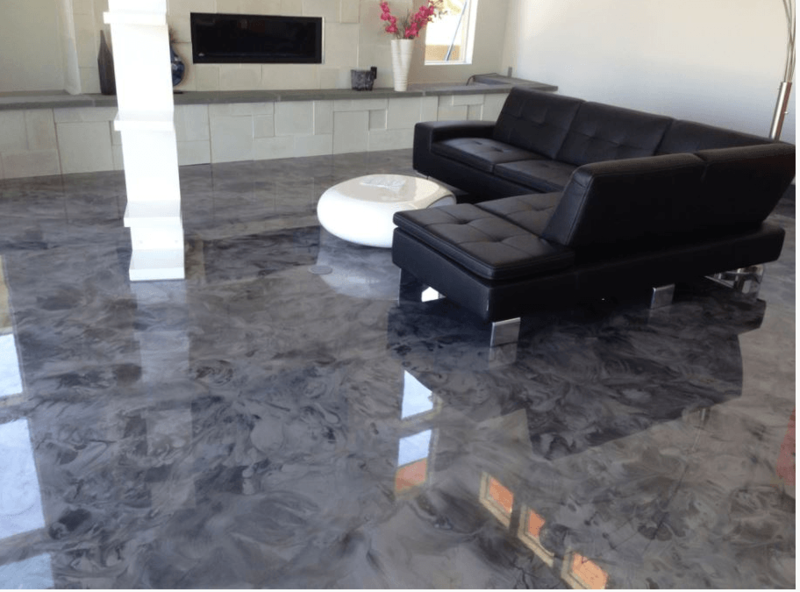 Installing polished concrete in your home provides benefits that you will inevitably enjoy. Polished concrete can last a lifetime. The sheen of the floor can be maintained with regular cleaning. Polished concrete will remain a beautiful design element to any home because of its timeless beauty and elegance. Polished concrete is feasible for indoor and outdoor application. This flooring option comes with timeless and neutral qualities making it an ideal choice for a wide range of decorative themes. Any theme of motif in your home will go well with polished concrete floors. Polished concrete floors are easy to maintain. It is important to install a baseboard when installing polished concrete so the walls do not get dirty during mopping. Regular mopping is all that is needed to free this flooring option with dust, dirt grime and strains. It is extremely affordable to install polished concrete. It provides high value for money because while it is low in cost it is high in aesthetic appeal. Existing concrete slab can be used to build your new polished concrete floor. No new materials are needed as the existing concrete surface will serve as the foundation of polished concrete. The polished concrete process includes grinding, honing and polishing. Each phase has a required grit sequence to allow the evaluation of the entire process. The polished concrete contractor checks the progress of the level of sheen of the concrete surface making sure the final stage will achieve the level of sheen desired. Diamond abrasives are the most important and versatile equipment used in the polished concrete process. Grinding the concrete surface with grits in 30, 700 and 120 will make the concrete surface smooth. Stains or dyes and densifier are applied to achieve the desired color. The concrete surface is polished using a 400-grit resin to allow the shine to appear. The brightness and clarity of the sheen will vary depending on the resin grit. This is referred to as the honing process. Concrete will be further polished with 800, 1,500 and 3,000 resin grits to achieve the desired level of sheen. Using 3,000 resin grit will make the concrete surface have a high gloss finish. After all the polishing steps are completed, a burnishing pad is used to clean the resulting concrete floor to give it a little more shine. The application of polished concrete is not a simple task. There are a lot of steps involved in the process. There is also a need to used specialized equipment to ensure the polished concrete floor achieves the right level of sheen. If you are decided on installing polished concrete. Get in touch with a professional flooring contractor to get the job right the first time. Did you find this article to your liking? please visit Dallas Epoxy Pros or you can also check out waterproof floors. That’s true. Epoxy floors can have many layers and membranes based on the type of floor you are looking for.